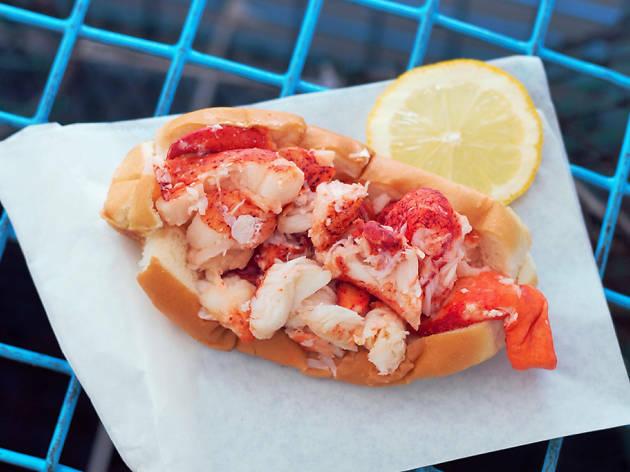 Sure, dining at the best restaurants in Las Vegas and the best steakhouses in Las Vegas are experiences to be treasured but, sometimes, all you really want is tasty grub in a pinch—without the hustle and bustle of fine dining establishments. 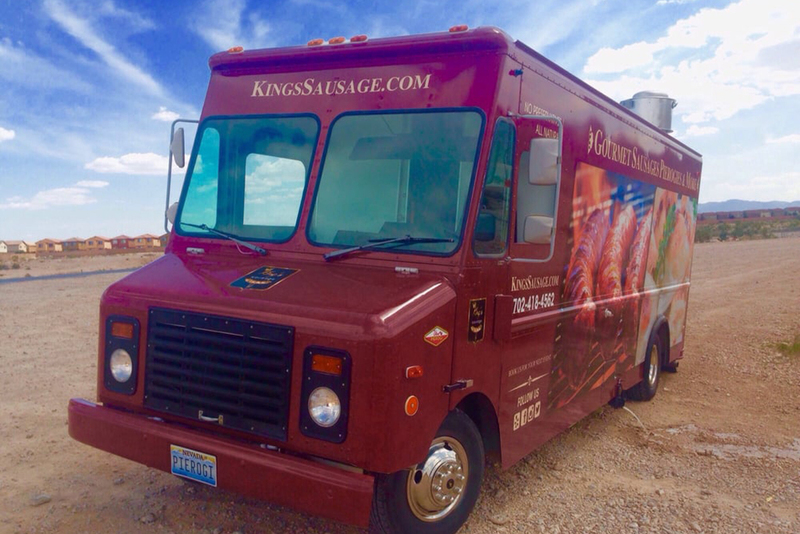 Enter the best food trucks in Las Vegas, serving delectable pasta, burgers, tacos, pizza and some of the best hot dogs in Las Vegas from mobile kitchens. Going out to lunch just got that much more exciting. 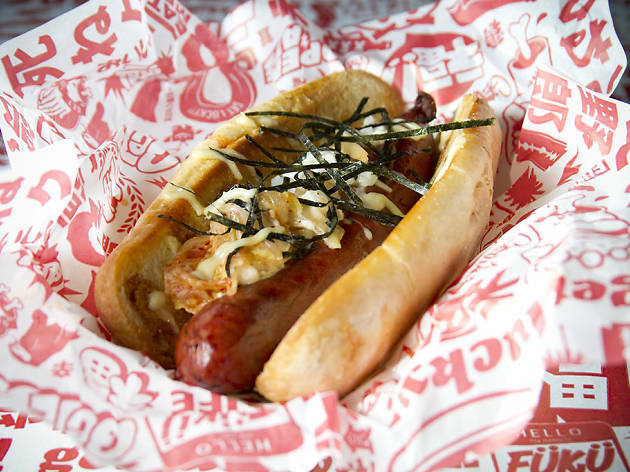 Fuku set the bar for fast food trucks back in 2010, and its Japanese-meets-American burgers have been crushing hunger pangs ever since. Like egg on your burger? Then the Tamago is the object of your desire—a juicy beef patty topped with furikake, crispy onion strings, teriyaki, wasabi mayo and, of course, a fried runny egg on top. Not sold on the yolk? 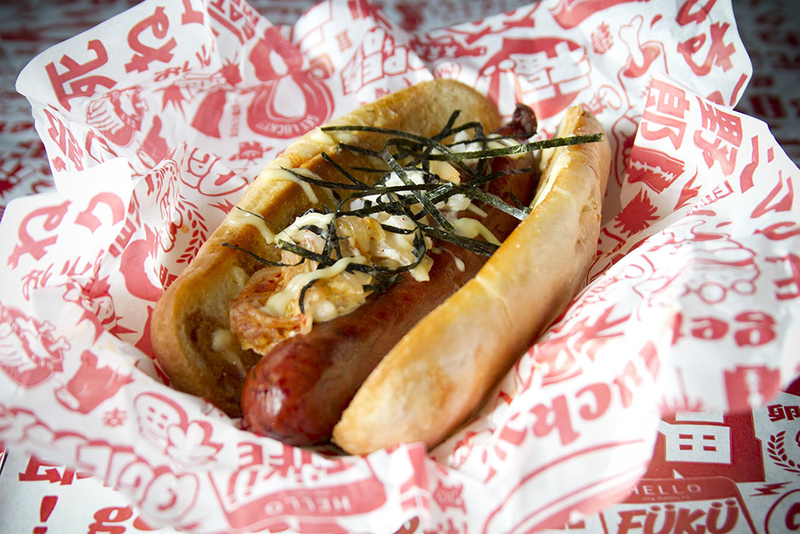 The original Fukuburger is a trusty dinner companion, as is the Naga Dog—a hot link topped with grilled kimchi, daikon relish, wasabi mayo, spicy kabayaki sauce and nori. 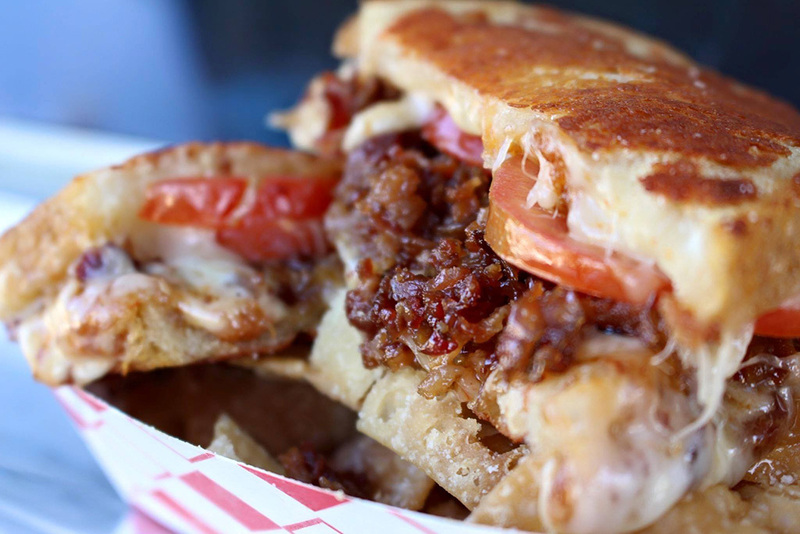 It’s as American as it gets: melty, cheesy and crispy goodness. Give mom’s grilled cheese an upgrade with the Jam On It, a fan favorite with maple bourbon bacon jam, muenster cheese and sliced tomatoes on parmesan cheese-crusted sourdough, or find Nirvana with the Daddy’s On A Roll—deep-fried mac and cheese egg rolls slathered in kimchi sauce. 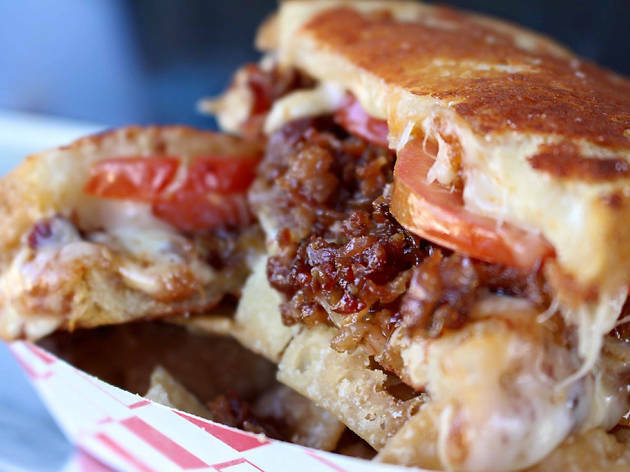 From Flamin’ Hot Cheeto-crusted sandwiches to grilled cheeses stuffed with pepperoni and pizza sauce, Stripchezze is the munchies truck you’ve been dreaming of. This truck has locations all over the country, and now Las Vegans can get their hands on authentic seafood straight from the Gulf of Maine. You won’t go wrong with the o.g. 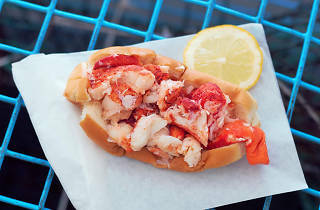 Maine lobster roll, served chilled with a touch of mayonnaise on a New England style roll, or the Connecticut style roll served warm. Other fresh options abound, including a 4 to 5 oz. lobster tail in the shell and served with drawn butter, lobster tater tots and lobster quesadillas. Sweet and salty your thing? 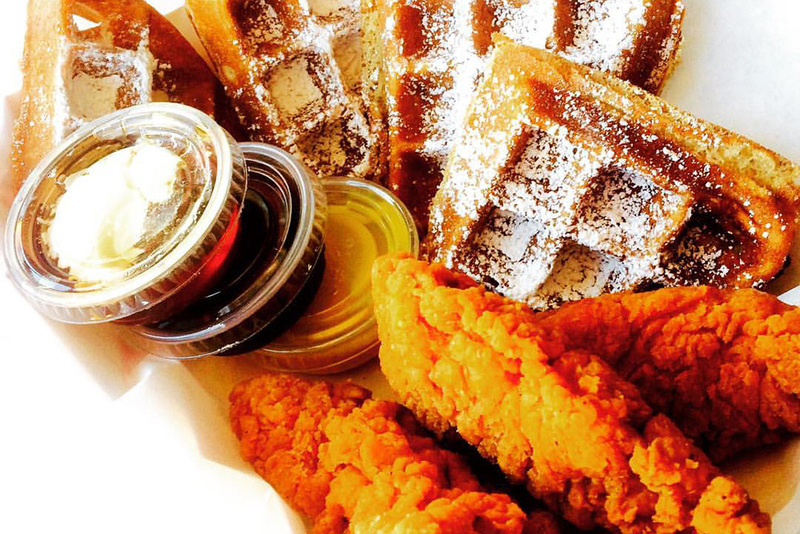 Sticky Iggy’s creations go big on flavor—like chicken-served-in-a-waffle-cone big. 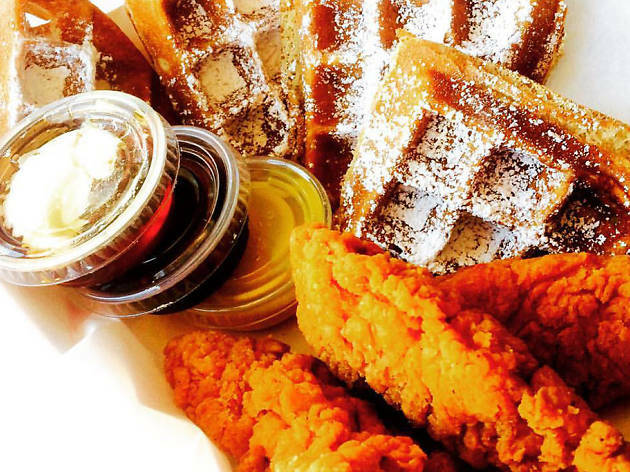 There’s a donut waffle (dubbed the Wake-n-Bake), waffle batter-fried chicken fingers and a churro waffle that’s basically heaven in breakfast form. It’s the perfect balance of oh-so-bad yet oh-so-good. Unbutton your pants and go back for seconds. 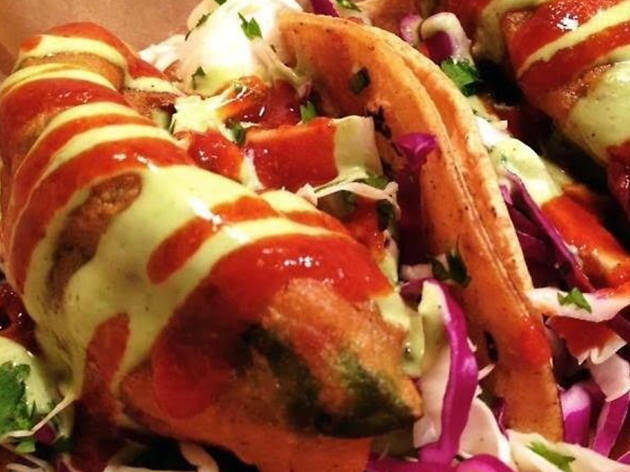 Finding vegan, organic grub isn’t exactly easy in Vegas, but getting your hands on plant-based eats at a food truck is even harder—unless you’re at Garden Grill. Barbecue-marinated and pulled jackfruit makes for hearty, meaty (gluten-free) tacos and the Reuben is satisfyingly close to the real deal, with toasted pumpernickel rye, house-made Russian dressing, locally made organic sauerkraut and house-marinated “meat.” Whether you’re vegan or not, this truck is worth the chase. 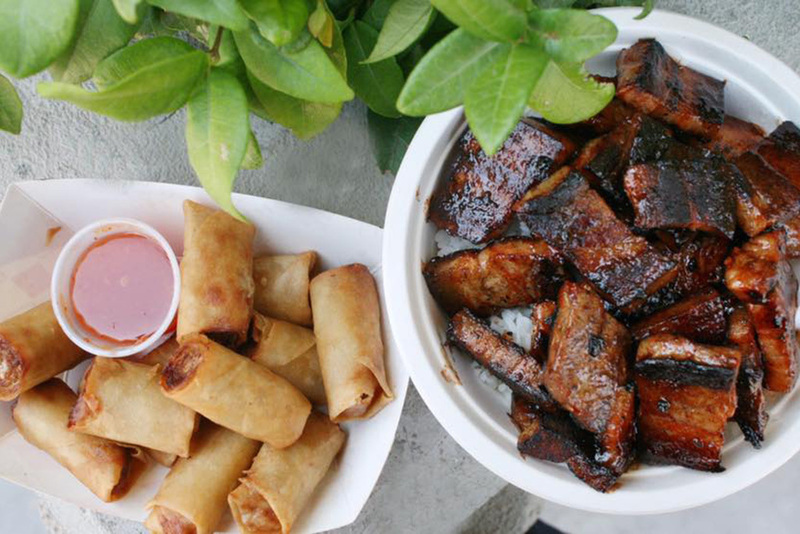 Chef Oming grew up in the Philippines in a city called Dumaguete, where street vendors are always grilling and cooking up delicious barbecued meats. 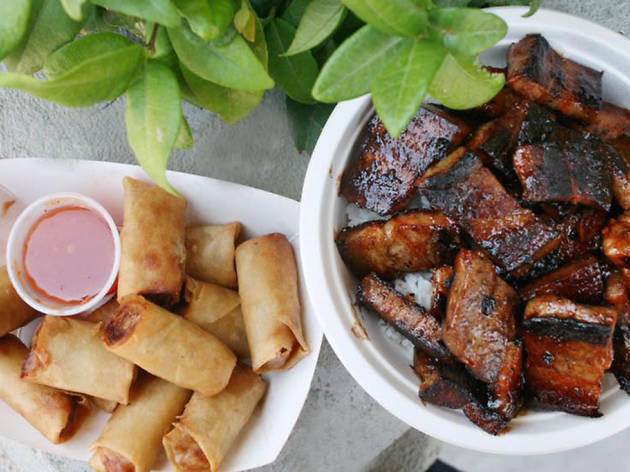 Oming’s Kitchen mimics the aromas and flavors of her hometown with classics like lumpia (Filipino-style spring rolls) and pork belly or chicken sinugba—savory and sweet morsels of fork-tender meat served over Jasmine rice. It’s comfort food at it’s finest. When you find this truck parked outside the bar after a long night of drinking, consider yourself (hashtag) blessed. 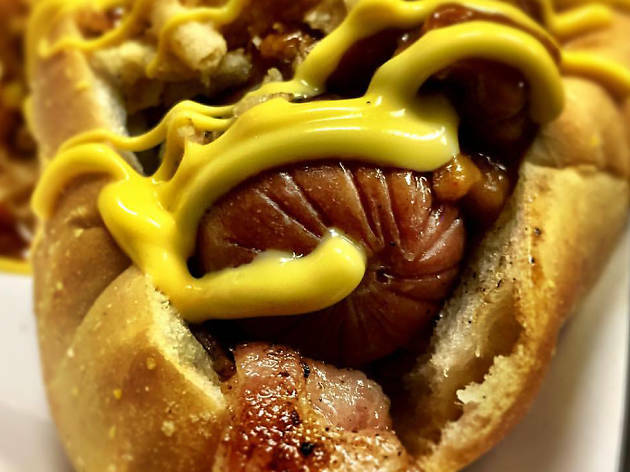 Dude Where’s My Hot Dog cooks up some out-of-this-world creations, including the taco dog—an all-beef hot dog wrapped in bacon and deep fried in a corn tortilla then served with guac, cheese and crema—and the Rebel, loaded with bacon, chili, crispy fried onions and cheese. Sometimes dreams do come true. The moment you sink your teeth into that sweet, crunchy-soft exterior is pure bliss. 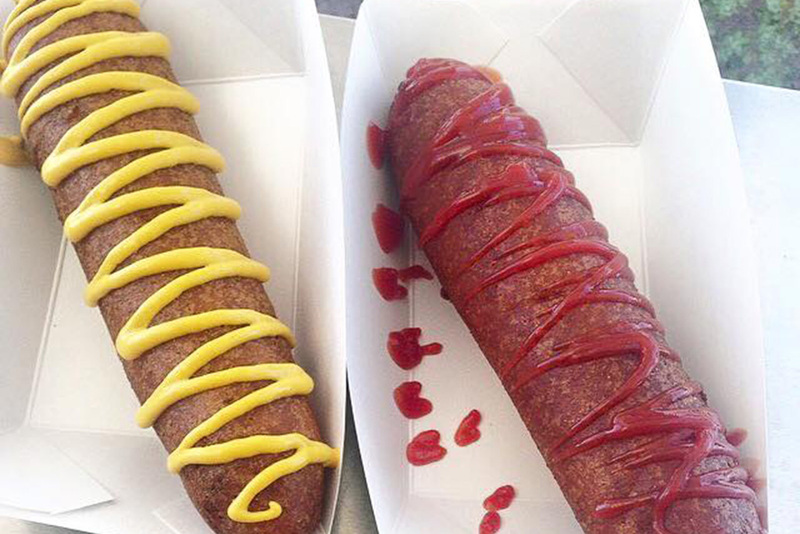 World’s Best Corndogs dips nearly 12 inches of beefy goodness into its secret batter, deep-frying each dog until golden brown. 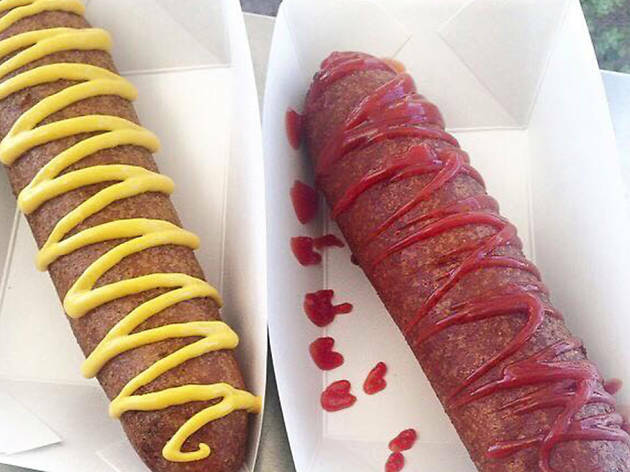 A half-sized version called the puppy is on the menu for smaller stomachs, and thick-cut cheese sticks (in cheddar or pepper jack) complete the menu. Simple, yet totally satisfying. 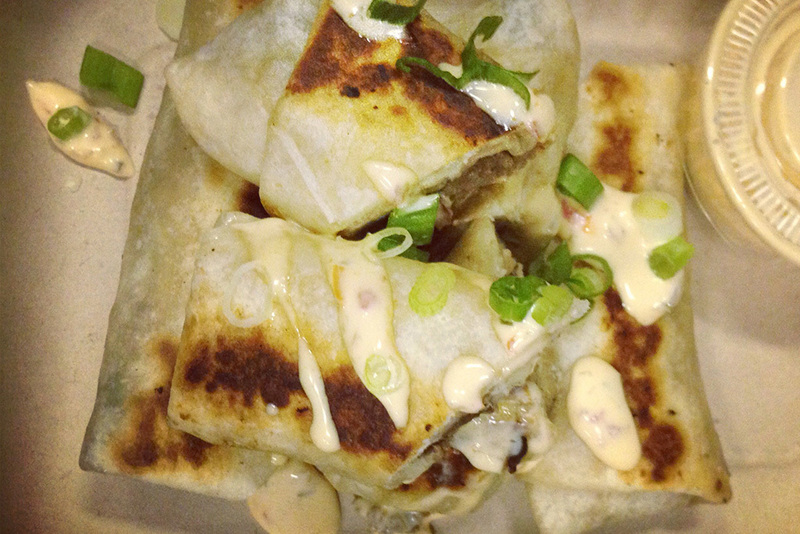 Something magical happens when you wrap hibachi grilled meat in a tortilla. 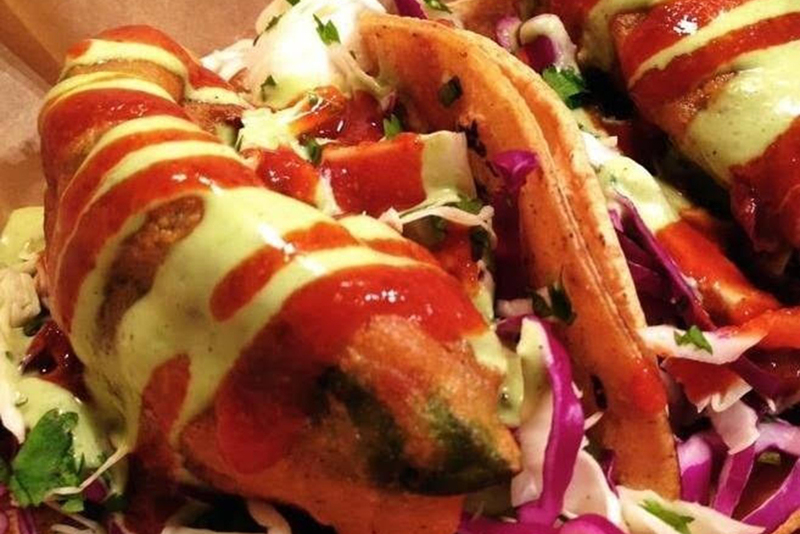 It’s that simple fact that made the geniuses behind Truk-N-Yaki meld both of these culinary worlds, creating a Japanese burrito that defies expectations. Choose from teppanyaki grilled rib-eye, chicken or shrimp; white or fried rice and your choice of sauce—or go sans ‘tilla and order a plate or rice bowl. No matter which road you choose, your stomach will thank you. 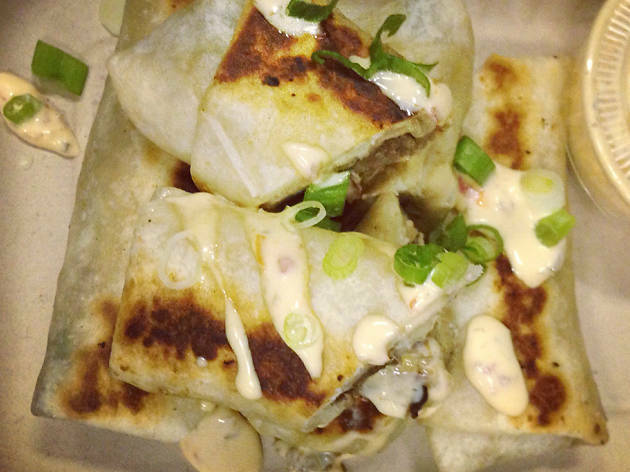 What started out as a grill cart outside a local bar has turned into a late-night destination. 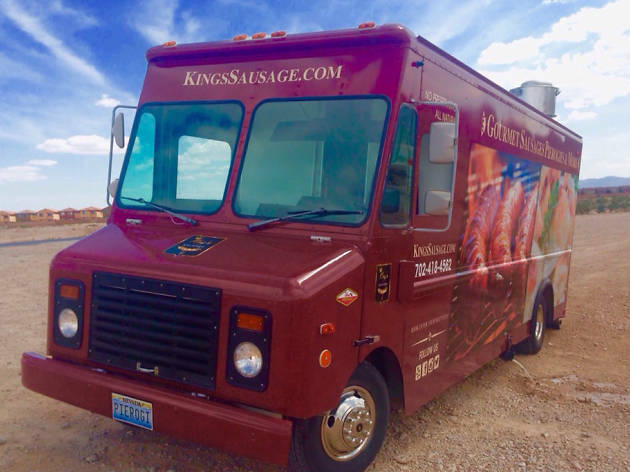 Choose from kielbasa, beer brats, chicken-pineapple dogs, pork and rice stuffed cabbage (galumpki) and cheese pierogis served with berries and sour cream. 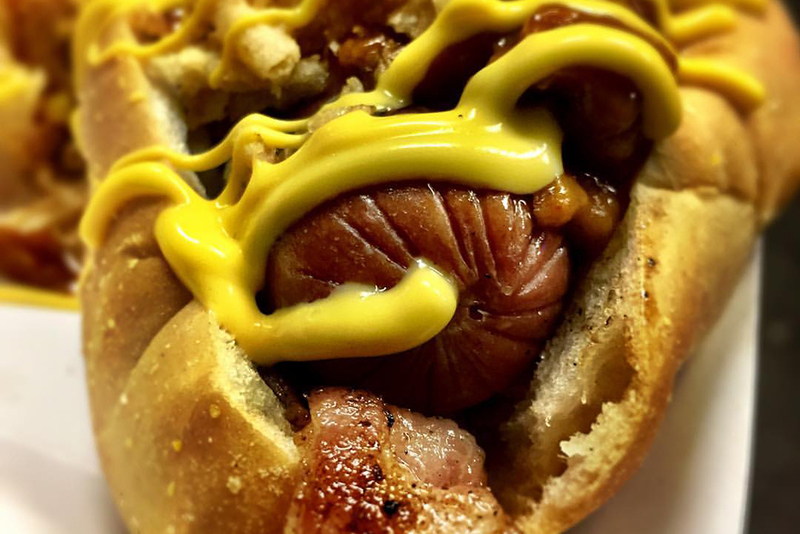 Whether you grew up in Chicago and miss your favorite brat spot or it’s your first time trying Eastern European cuisine, King’s will have you coming back for more.